Budhiparamaaya Neekkam malayalam movie directed by Vinod Naraynan is a romantic thriller which is much associated with the culture of Thiruvanthapuram. The movie is being produced by Baburaj Asariya under the banner Desperate Dudes Productions. Sajath Vaudevan of Autumn Leaf will compose the music for the movie. Touted as a romantic thriller, the movie will start rolling very soon. 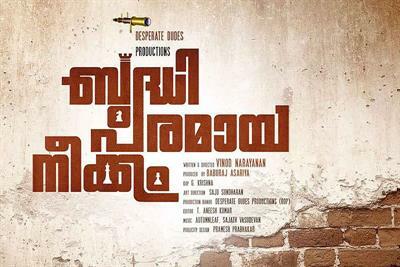 Desperate Dudes Productions (DDP), which has been a part of the Qisa 2014, a short film festival is venturing into the malayalam film industry with their debut project. The movie titled 'Budhiparamaaya Neekkam' is the debut venture of Vinod Narayan. Touted as a romantic entertainer, the movie will be produced by Baburaj Asariya under the banner Desperate Dudes Productions. Sajath Vaudevan of Autumn Leaf is in charge of the music department while the camera will be handled by G Krishna. Scripted by the director himself, the story set in the capital city is said to be very much associated with the culture of the town. The makers plan to cast new faces in lead along with prominent actors from the industry. Earlier Desperate Dudes Productions has associated with a music single titled 'Still Away' which was programmed and sung by Vishnu Thulaseedharan. This music single set on the theme of Heartbreak was the combined effort of few youngsters which included Krishna.G, Atmabodh, Arun Puthenparambil, Neha Bajaj, Sujith Kumar and Jimmy Joseph. The song was released through YouTube and gained attention from the audience. Krishna, who has crafted the song, has an experience of working with major Television channels for the past few years. The young brigades are looking forward for a real opening to show their talent on big screen and create their own space in the film industry. The team has released the first look poster of the movie. Like the previous years, 2015 too will witness the arrival of new faces both in front and behind the screen. Other than big budget projects, movies made with limited budget are expected to reach theatres. It would also give handful of opportunities for fresh faces to present their talent on the silver screen. Some of the most awaited movies in 2015 include 'Laila O Laila', Bhaskar The Raskal', King Liar', Oru Vadakkan Selfie', 'You Too Brutus' and many others.